The Radio Equalizer: Brian Maloney: Overconfidence At Issue? Pitfalls Of Endless Fawning Coverage, Cut Bush Slack? Isn't nonstop fawning press coverage wonderful? Other than entrenched, well-connected liberals like Al Franken, of course, who exactly would have an idea of how that feels? For the Radio Equalizer, the toughest task is weeding through it, otherwise we'd cover nothing but Frankenfluff (a term we coined to describe the particular level of positive press Al routinely enjoys). Even this mainstream media lovefest can have pitfalls for unsuspecting recipients, however. Why? Because it eventually leads to carelessness and overconfidence. Particularly during recent television interviews, we've already seen that in Franken, who can't seem to understand why anyone wouldn't find the idea of Bush Administration executions funny. While a bit more subtle, he also tends to undermine himself in newspaper interviews, as well. In these excerpted interviews (click links to read the entire stories), take a look at his responses. 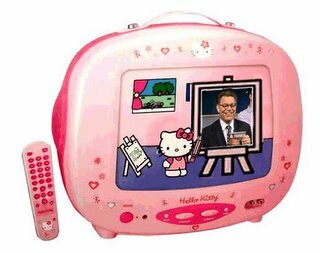 Franken may need some media training, in short order. Q: What have you learned by being on the road? A: The message you pick up is that when Washington is controlled by one party, the Republican party, that a lot of stuff is happening locally, in states and communities, that can’t be done in Washington. One of the reasons we came on the road is to find those kind of things that are happening. Q: The Air American network had a rocky start. Were you optimistic that a (liberal talk-radio network) could work? A: I was very optimistic. But I was caught by surprise when we hit that enormous barrier (in the early days of Air America) of not having any capital. Almost all of us at the network were blindsided by that. It was almost catastrophic. We almost fell apart. (Now) we are already a success. We have millions of listeners. It takes a few years for a start-up company like this to make money. A: I make nutritional candy. The nutritious part is the part that people need to know, should know, the good-for-you-to-know. The candy is the entertainment part. People need the candy to absorb the information. Q: Is radio easier to do than TV? A: It’s different than TV. It’s easier in certain respects. You don’t need makeup and props and set, so it’s a lot easier in that regard. There is a lot of prep. I need to read about the guests. And if they have books, I read the books, or part of the books. There is keeping up with what is in the news, trying to read as many papers as I can. Every day I get the New York Times, the Washington Post, USA Today, the (New York) Post and (the New York) Daily News. Q: What’s been your darkest day so far? A: The toughest day was Nov. 3 (after President Bush was re-elected). It was like thank God I had to do the show, or I wouldn’t have done the show. (Kerry) conceded while we were on the air. It was horrible. It was … the most important election in a generation and we lost it. I had paced myself to make it to Nov. 2, without thinking about Nov. 3, 4, 5, days on which we also had shows. I was pretty tired. I felt my job was to put this in perspective and to talk about some of the good things that happened and to sort of entertain, rallying of the troops. Q: Growing up, did you listen to radio? Is there a radio personality you admire? A: I think there’s a thing or two (in the show) from Garrison Keillor. I am so not like other radio people. I’m not like Rush (Limbaugh) or Paul Harvey or Hannity or Arthur Godfrey. Bob and Ray and Jack Benny are huge influences. Q: How much longer will you do the show? A: I don’t know how much longer I can do the show. I am not allowed to talk about the terms (of his contract). But I will be here for a while. Sure, on the road, a person gets tired and sometimes things are said that ought not be revealed. But should Franken have given the interviewer such a cryptic response to that last question? Probably not, since it suggests he might soon leave the network. Overall, a confusing answer. If things are going so well at Air America, then why isn't he sure how much longer he'll stick around? That Minnesota senate race he's toyed with is still rather far down the road. WASHINGTON — He's the self-described "hardest-working guy in show-biz politics." He's a comic and satirist, a best-selling author and the guy who established a beachhead for liberal talk radio in this country. So why does Al Franken want to chuck all that to run for the U.S. Senate? Before the question is fully asked, Franken is posing it himself. "Could I do more on the radio?" he asks. "That's part of the calculus. But I'm going to do the things I need to do, if I make the decision. "Let's just say I'm seriously considering it." Franken, 54, is grappling with the same choice facing many American entertainers who have emerged as major voices for the U.S. left — remain inside or outside the political process? Many however, believe Franken, the long-time Saturday Night Live writer and occasional performer, an Emmy and Grammy winner, trumps them all because of his use of the written word. His latest book, The Truth (with jokes), is the type of acerbic anti-George W. Bush rant and debunking of right-wing media that delights American liberals and immediately puts it on best-seller lists. Such incursions by "liberal Hollywood" were thought by some to give Bush an unintended boost during the 2004 presidential campaign. Franken's response? With Bush sitting at 34 per cent approval in some polls, he doesn't see the risk. "His credibility is not very high right now," he says. "He's an oil guy, and I think people are starting to figure it out. And those 34 per cent are not the kind of people you're going to be convincing about anything anyway." Franken will answer questions with a candour that indicates he has not fully crossed the politician's threshold. He admits he doesn't know what should be done in Iraq, even though he knows he doesn't back the immediate withdrawal of troops. "I really don't know what to do," he says. "We've really been put in an impossible position by this administration. "It's as if the president is saying, `Okay, I lied you into the war. We didn't send enough troops. We allowed the looting. We allowed incredible corruption so electricity and water didn't get back up. We allowed looting of weapons and explosives caches. We disbanded the Iraqi military and told 400,000 guys we're not going to pay you any more and take your weapons and get lost. We tortured people at Abu Ghraib. "`I brought us this far, now you figure it out.'" Having botched the war, Franken says, he doesn't trust the Bush administration to withdraw troops properly. But Franken says it is an oversimplification of his position to say he opposes the war: "To say I oppose the war today could mean I am for an immediate withdrawal, and I'm not." But Franken says Bush is not all bad and he does want to cut him some slack on environmental issues. The U.S. president didn't take the country to war over oil, Franken says before offering his report on a fictional address to the nation by Bush. "He pointed out Iraq has 360 sunny days a year and the other five are partly sunny. It turns out we went there to secure their potential solar power. "He's particularly excited about this region he has read about recently called the Sunny Triangle." One would imagine Franken's large team of Harvard assistants catering to his every whim might take issue with his "hardest working" designation. Beyond that, is it really wise to give conflicting information regarding future plans? Are liberal radio listeners willing to invest in a daily commitment to his show if he has one foot out the door? To his fans, it's an unwise signal to send. Worse, it makes the program appear simply as a vehicle to launch a political campaign. With Franken at the heart of the liberal network's lineup, that does tremendous damage to its potential listener loyalty. It also seems unacceptable to criticize Bush, while admitting having no idea how to deal with the current Iraq situation. Is that any way to launch a US Senate run? Franken opposes Bush, but supplies no alternatives? Maybe he's simply a "Not-Ready-For-Primetime-Player". Overall, the Toronto Star interview reveals a wishy-washy Al Franken, confused on key issues and in no position to provide leadership, in any venue. Why not support the Radio Equalizer at the same time? Your Amazon orders that originate with clicks here, regardless of your final selections, help to support this work. Thanks again! Hello Kitty Tackles Frankenfluffy and Frankenbits by Pete at IHillary. Brian Maloney-Baloney-Malarkey at The Radio Equalizer (an ironic name since he's anything but an equalizer) comes up short again at his attempt to put liberal radio and its hosts into their "proper" place. This time he takes on front man Al Franken. The Radio "Equalizer" willfully confuses sarcasm and humor with threats — the kind Bill O'Reilly actually makes, which doesn't seem to bother Mr. Maloney-Baloney-Malarkey. 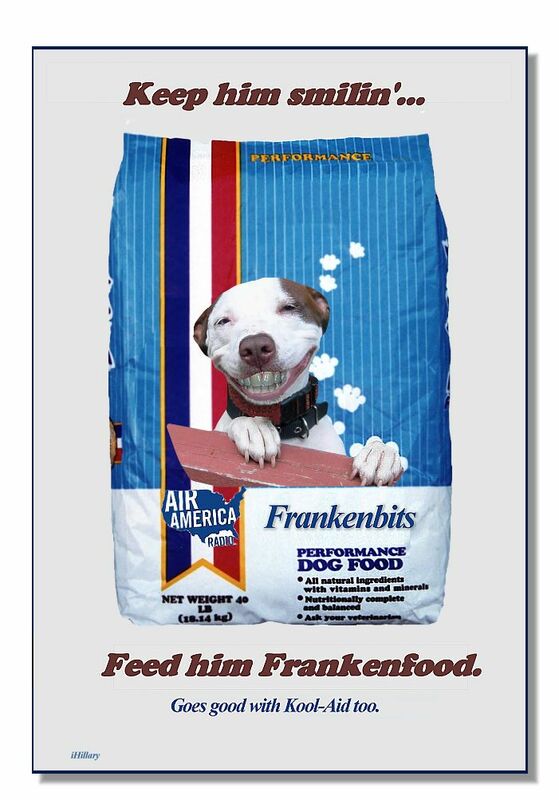 He makes mountains out of molehills in some of Franken's statements and seems to find some hidden meaning that no other reasonable person would see. It's a hack job of a post that has more fluff than real hard-hitting critiques. But, like his idol, Malice in Malkinland, that's typical for this wingnut bloviator — all hate based on hysterical nothingness. "I will be here for a while." 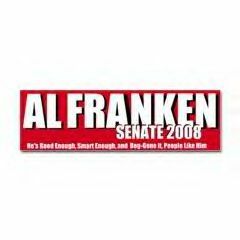 Now, it's true that Franken says he cannot reveal the specific terms of his deal, but anyone with a grain of objectivity would interpret the quote as Franken reassuring people that he would remain at Air America, well, "for a while." How does Maloney interpret the quote? He thinks "it suggests he might soon leave the network." You've got to be kidding. You can't just take a quote and project a completely opposite meaning to it. It's right there in front of us Brian, we can actually read it. Not once does Franken say he's not enjoying the show, or his future at the network is in jeopardy, or anything else that would imply some daylight between staying and going. Once again, Maloney does one Google news search, highlights text of easily interpreted quotes, and pretends that the quotes break some conspiratorial news that only Maloney could possibly see. Connecting dots ain't impressive if you're the one drawing the dots. A: The toughest day was Nov. 3 (after President Bush was re-elected). Oh, yes, yes. The day you found out that NO ONE CARES WHAT YOU SAY. Or that you were a NEGATIVE influence on the election! (Kerry) conceded while we were on the air. It was horrible. And now that Bush is moving to the RIGHT, his poll numbers are going UP! Huh? How is "I will be here for a while" a "cryptic response?" And how does it suggest "he might soon leave the network?" If anything, it suggests the opposite. Had to repost and make one thing clear your two fans here don't seem to get. I post here whenever you email me because I have taken a solemn vow not to repond to you in private and to only respond to you in a way that will humiliate you. Also, a comment in your last post said that it was your lamest ever. I'd like to defend you by saying it wasn't- this one is. Showbizspeak: "I will be here for a while." I'm wondering what polls Tom C. is looking at... must be the Malkin-Maloney-Baloney polls of registered right-wing Republicans. All the other credible polls show that Bush has done nothing but decline since his re-election. Now the majority of the country is lamenting like Al Franken did on that day. Franken says "We have millions of listeners. It takes a few years for a start-up company like this to make money." Maybe that's true for a start-up that has no big investors, big media names or big press outlets backing it. But AA had all three of those things in abundance and still no one wants to listen. It also seems that increasingly the investors and the media names (i.e. celebrities) are actually distancing themselves from AA as if they had Leprosy. A true start-up could be given some slack, but with the kind of head start they received they've no excuse for their poor showings...only the reality of a bad product that nobody wants. I've got the last Arb trendbook for Air Idiot here on my laptop (it's not hard to get, you just cut them the check), and your faked namesake, of all people, should NOT be playing the "numbers" game...if you know what I'm saying.